This level has hard difficulty. 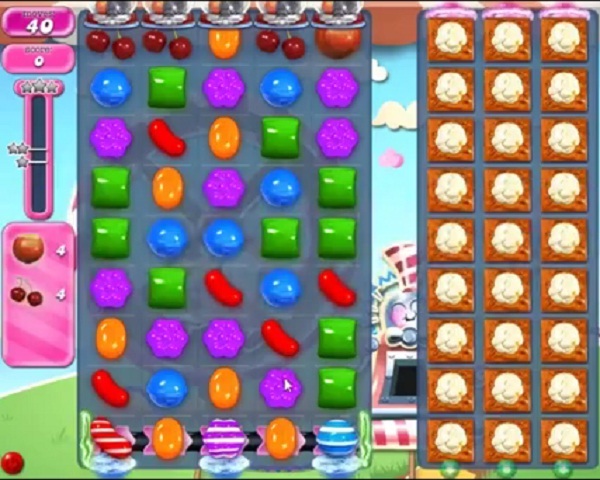 For this level try to play more from right bottom part of the board and make special candy. Combine special candies with each other or play near to ingredients to take them out from the board. How come I get part way through this level and the screen goes off. My life is then lost. Absolutely ridiculous!!!! How come I get part way through level 1773 and the screen goes off. On it for ages, absolutely ridiculous!!!! I also then lose my life. Could use a good board .Thanks for your co-operation.Greatly appreciated. 1773 completed! 4 boards! Break popcorn use CB + CB. Hopeless! I hate this level! Have almost beat it, only to run out of moves, popcorn is too hard to pop, and when the right board finally develops, all the CB’S explode together, leaving the items still there. Very difficult to move them on out!!!!! This is a very frustrating level. I went through 13 wheels and still could not complete this level. Guess it’s time to find something else to do. This was a very hard level for me! Finally got a lucky board after a week or more of play! Glad this one is over! easy. done on second go.